Description:The zoo isn’t what it used to be. It’s run down, and Hippo hardly ever gets any visitors. So he decides to set off for the outside with his friend Red Panda. To make it in the human world, Hippo will have to become a Hippopotamister: he’ll have to act like a human, get a job, and wear a hat as a disguise. He’s a good employee, whether he’s a construction worker, a hair stylist, or a sous chef. But what he really needs is a job where he can be himself. I received a copy of this novel from the publisher in exchange for an honest review. Hippopotamister is an amazing and beautiful children’s book! The bright and colorful cover instantly caught my students’ eyes, and the stunning pictures inside kept their interest piqued throughout the entire 96 pages. “How did you read a 96-page book to a group of 2nd graders in one sitting?” you ask. Despite the length, Hippopotamister is set up in panels comic-book style, so there’s not a whole lot of text. It’s a pretty easy read for even some of my lowest students, and again, the beautiful and detailed pictures really encourage comprehension of the text. My students did a great job of making predictions and inferences just during the picture walk alone. This book will definitely be a fixture in my classroom for the foreseeable future. I just have to be extra careful not to let those little paws do any major damage! As a teacher and an adult, I found the story more than suitable and entertaining not only for my students, but for myself as well. 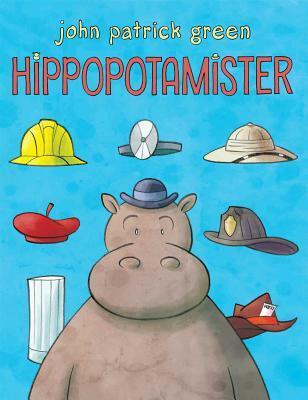 I still have a super soft spot for children’s books and Hippopotamister has entered the Top 10 as one of my favorites. Red Panda does an amazing job providing the comic relief to Hippo’s quest for self-discovery. But the most important aspect of this story however is the theme: be yourself and do what makes you happy. John Patrick Green grew up on Long Island and has worked in New York City since graduating from the School of Visual Arts with a degree in graphic design. He was the comics consultant for Disney Adventures magazine, where he wrote and often drew the popular Last Laugh feature. John is the co-creator and illustrator of the graphic novel series Jax Epoch and the Quicken Forbidden and Teen Boat!, both with writer Dave Roman. 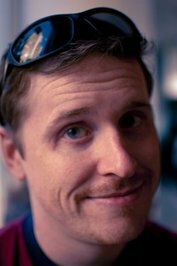 He has also worked as a writer, illustrator, or designer on comics and graphic novels for Nickelodeon Magazine, DreamWorks, Scholastic Graphix, and DC Comics. John lives in Brooklyn with zero cats and way too many LEGOs. See more of John’s work at www.johngreenart.com. Schedule: See more of John’s exclusive art and check out reviews at other stops on the blog tour!